Nothing can ruin a well-maintained yard more than mounds of soil and surface tunnels. 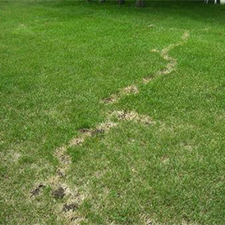 Though most land owners have never seen an actual mole, the damage they can cause to lawns and gardens is unmistakable. Moles can dig tunnels at a rate of one foot per minute, making them very adept underground architects. The mole is a small mammal known for creating and inhabiting underground tunnels. With long, curved claws the mole can fashion long passageways under the soil surface. There are nearly 20 different species of mole in existence, some of which are aquatic or semi-aquatic. On average moles grow to between 4 and 6.5 inches. Contrary to popular belief the mole has very small eyes and ears that are covered by a layer of fur. This characteristic explains why they have such poor eyesight. Due to their subterranean lifestyle, it is believed these changes happened due to natural selection. The mole has a phenomenal sense of smell that it uses to quickly catch prey. Unlike most mammals, the mole’s lack of sight has led to the development of a stereo sense of smell. Aside from a developed sense of smell, the mole relies heavily on the sense of touch. The short, thick tail found on moles is used to guide the mole backward through a tunnel. This assures the mole that clearance is available. The blood cells of moles have unique hemoglobin proteins and can tolerate higher carbon dioxide levels than most mammals. This characteristic has perfected their ability to survive in subterranean environments low in oxygen. By reusing oxygen inhaled from above ground, they are able to stay underground for extended periods of time. The mole will dig a dedicated highway of sorts that will become that will lead to the site of their burrow. In most instances, this highway can be found nearly 10 inches beneath the surface to function as a safe space when heat, dry weather or frost become excessive. The nest of a mole is usually located around one foot below the soil surface. Moles will typically place the nest under a boulder, stump, or other object and dig out several entry points. When moles invade a new property they have the potential to cause damage very quickly. It is crucial to identify the problem before it becomes too big of an issue. Three distinct changes to the landscape of a home happen when moles begin burrowing underneath the soil of a new potential homestead. 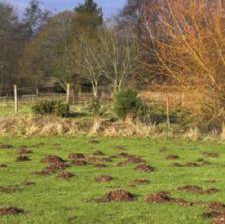 Molehills – When the mole burrows it creates a displacement of soil underneath the ground. To bring a tunnel to completion the mole will expel displaced dirt to the surface creating mounds of loose soil. Molehills can be a sign of a new tunnel that has recently been created or a repaired tunnel that has caved in due to surface weight. While it could, multiple mounds do not indicate a lot of moles. Constant digging by one mole has the potential to produce up to 100 mounds within one month. Surface Tunnels – Often found alongside solid objects, such as driveways and foundations, surface tunnels have the appearance of small ridges. Most often surface tunnels can be found in moist soil conditions where worms and grubs can be found. Surface tunnels are created when moles forage for food just beneath the ground. Soft Spots – With the displacement and excavation of subterranean soil, the ground begins to develop soft spots. When pressure and weight are applied to these areas they will generally cave in and create a hole of sorts. The Eastern mole can live up to six years without predatory influences but typically survive three. As a mammal, the mole has a similar gestation period to that of the opossum or hamster. Mating once annually, the carrying period of a female mole is four to six weeks. At the completion of this time, a litter of two to six pups is born. Moles are very solitary mammals and only meet to mate, territory control is fierce and can result in fighting when tunnels join. Pup – When born the mole is considered a pup and is cared for in a hollowed out chamber lined with dry plant material. After 14 days the pup will begin to grow hair reminiscent of what is seen on the common mole. Mole pups are weaned at four to five weeks old and within 33 days become adults by leaving the nest. 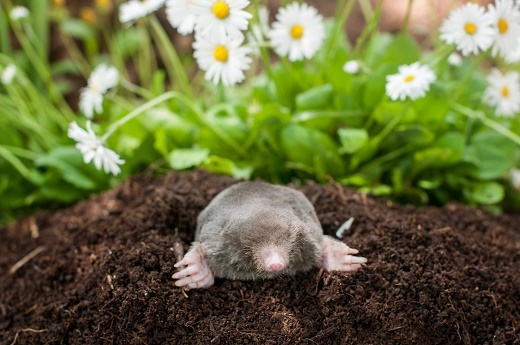 Adult – After five to six weeks, adult moles will leave the tunnel that has served as their birth and growth place. Once they leave their mother they begin digging their own home tunnels. If they survive to the next breeding season and successfully find a mate the process will start over again. Within the state of Oklahoma, only one species of mole currently exists. The Eastern mole is a pivotal part of soil aeration and larvae removal with the ecosystem of the state. Given their subterranean burrows, moles are effectively fertilizing the soil and can be found in woods, fields, lawns and gardens. Eastern Mole – The Eastern mole has the widest range of any mole species within North America. It’s medium size and primarily gray color is often overshadowed by the hairless, spade-like forefeet used by this mammal to dig. The Eastern mole primarily feeds on earthworms, but will eat other insects when available. Daily the Eastern mole will consume 25 to 100% of its own weight in food. The average Eastern mole home spans 1.8 acres but varies based on gender. Male burrows averaged 2.7 acres, while females only measured 0.69 acres. The Eastern mole has proven itself to be a good swimmer and travel is usually not limited by rivers. Active at all hours, this mammal typically peaks in activity near dawn and dusk, resting between three and seven hours between labor periods. This species currently faces no major threats and is of low concern to conservationists. The species is abundant and occurs in protected areas. This species uses its broad, polydactyl front feet with well-developed claws to expedite excavation projects. Both sets of feet on the Eastern mole are fitted with sensory hairs that also aid the mole in digging. Enlarged bones on the front limbs give the mole the support and strength needed for extended exertion. When dealing with moles there are no specific diseases that can be transferred to humans. Due to their subterranean life, they are excellent carriers of external pests and parasites. When handling moles, safety measures should be taken. Infection – If bitten by a mole it is important to properly clean and disinfect the wound. Redness and swelling are side effects of the bite. However, if the wound becomes worse with time instead of healing properly, medical assistance may be necessary. Rabies – Though considered low risk for carrying rabies, the mole can be a carrier. Rabies is transmitted through the bite of an infected animal and is typically received from skunks and raccoons. Rabies spreads to the central nervous system and can ultimately cause death and brain disease. Fleas – The Ctenophthalmus pseudagyrtes is a species of flea commonly found on small mammals. It is widespread throughout North America, east of the Rocky Mountains. Symptoms of fleas can include skin infections and severe itching. Mites – The Pygmephorus is a genus of mites that can be found on small mammals and are widely dispersed throughout North America. At least thirteen species of mites from the genus have been found on small mammals within the country. Sucking Lice – There are nearly 500 species of sucking lice, or Anoplura, within the world today. Studies have found the Eastern mole can be a carrier of one particular species, Haematopinoides squamosus. When dealing with moles professional assistance is recommended. Depending on the amount of tunnels and moles on the property. There are several steps you can take to try and minimize a mole problem and help prevent them from targeting your lawn or garden as a potential residence. These methods may or may not prove to be effective, contacting a professional is the only proven solution for mole removal. It is believed that due to a perfect sense of smell, certain scents can help deter moles from properties. Repellents with a castor oil base tend to be the most popular but has never been replicated after the first study. The theory is that spraying a mixture of castor oil and dish soap on your lawn and around tunnels monthly or after rains moles will be less likely to invade the property. Planting chocolate lilies and garlic plants have been touted as an efficient repellent for moles. The best part of this method is the ingredients are all natural and provide no danger to pets that may be curious. Removing the moles food source, white grubs and earthworms, through the use of pesticides with the active ingredient trichlorfon or carbaryl will help cut down the grub populations within your lawn. It is recommended that it is done in the fall and given adequate water. Anti-mole gel is a poisonous mole attractant that can quickly and painlessly dispatch or deter moles. This fast-acting formula is supplied in syringes, making placement easy. By finding active tunnel entrances, one can concentrate the poison more effectively. Traps are a considered a human and inexpensive way to deal with a mole problem. By placing a can at tunnel level, moles are more apt to venture into it. One old-fashioned method for trapping moles involves running a garden hose into the entrance of a mole tunnel. In theory, the water begins coursing through the tunnel the mole will make haste to escape through the exit. With help, another individual can wait and trap the mole. Unfortunately, moles have been found to tolerate water in most instances. Ultrasonic devices have become popular in recent times. The idea of an ultrasonic devices is that by producing underground pulses rodents, and moles, will be irritated by the noise and will move to a quieter location. The effectiveness of these methods has not been proven. All attempts to use these methods are done at the risk of the individual. Though these are common suggestions given through various online mediums, DIY repellants can be ineffective and sometimes dangerous. It is important to read all directions and safety warnings if attempting these methods. The best option for mole removal will always be to call a professional. Did you know that moles have a chemical in their saliva that can incapacitate earthworms? Moles have been known to collect hundreds or thousands of live earth worms, preserving them in special tunnels where they can be eaten later. The mole will squeeze the dirt and guts of an earthworm before consuming it and can eat over 50 pounds of worms annually. Contrary to popular belief, moles do not hibernate and will work year-round to catch food. We hope this information helps you prevent mole problems and keeps your home free from damage all year long. If you are struggling with a mole problem at your home or business, give us a call or visit our website to start a no obligation mole evaluation. The talented technicians at Arrow Exterminators can identify any type of pest and identify the best course of treatment to get rid of it. We’ll create a custom pest control plan to make sure we eliminate every last one from your home and keep them away for good! You can call our trained pest control experts at any time with questions about pest control methods or pest prevention techniques. You can also find us on Twitter, Facebook and Google+ for more pest prevention tips and tricks. Contact Arrow Exterminators and our ant control experts will get you the help you need right away. Whether it’s a private residence, dormitory, hotel or any other type of property. Arrow Exterminators has been eliminating pest moles all over Oklahoma since 1952. We know mole control. If you’re experiencing a problem with moles, contact us to schedule your no obligation free evaluation.